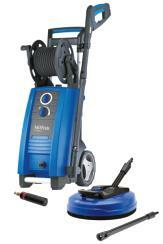 This top-of-line premium quality high-pressure washer satisfies all frequent and large cleaning tasks. Designed for durability with long-lasting induction motor and metal pump with brass cylinder heads. It offers good ergonomics and includes a long steel-armored hose to ensure maximum range of operation. The best choice for tough jobs like cleaning boats, pools, horse trailers and driveways. To increase performance, this Nilfisk can adapt to a wide range of optional accessories. 15 m steel armed high pressure hose enhances flexibility.